Celebrate Orange County’s 125th anniversary. 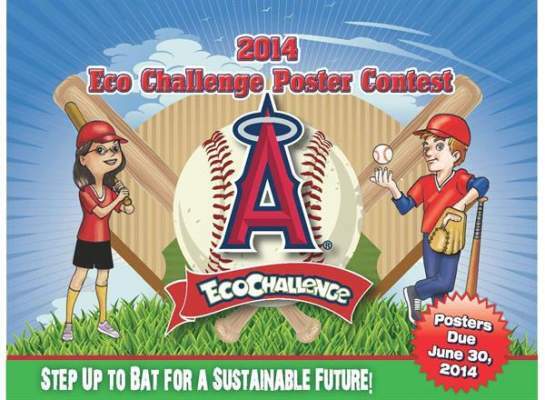 Step up to bat for a sustainable Eco Future! The challenge invites boys and girls between the ages of eight and fourteen (8-14) to use their imagination and get creative in designing a unique eco-themed poster. In celebration of the 125th anniversary of the County of Orange, the County is looking for young artists to create artwork demonstrating what the next 125 years will look like if we take the Eco Challenge and work toward a sustainable future. Contest is open to boys and girls who will be between the ages of eight (8) and fourteen (14) at some point during the Angels Baseball regular season. Materials: Poster should be designed on a white background. Artwork should not be computer generated. Paints, crayons, chalks, markers, pencils, pens, etc. are allowed. Content: Artists are allowed to incorporate text relevant to environmentally friendly message. The visual design of the poster must relate to one of the above themes. Poster should be vibrant and aesthetically appealing. Copyrighted characters or name brands (e.g., Coca-Cola, McDonald’s, etc.) should NOT be used in artwork; use of such brands or characters will result in disqualification. Please do not fold posters. Entries must be matted, flat or rolled, and not folded. Name, address, age, phone number, and district must be written on the back of the poster. Posters will be judged based on originality (20%), visual clarity (20%), relevance to theme (20%), artwork (20%), and effectiveness of message (20%). Winners will be selected by the County of Orange, Discovery Science Center and Angels Baseball leadership. Posters should be mailed or brought to Discovery Science Center at the address below by June 30, 2014. Limit one (1) entry per contestant. Winners will be notified by phone by July 31, 2014. Winners will have ten (10) days to claim their prize, after which the prize will be awarded to another winner. A completed Waiver Release Form must be submitted with your entry to be eligible to win. Any posters not claimed by September 30, 2014 will be recycled. To claim your poster, please e-mail ocecochallenge@ocwr.ocgov.com. The mission of the County of Orange is to make Orange County a safe, healthy, and fulfilling place to live, work, and play, today and for generations to come, by providing outstanding, cost-effective regional public services. OC Waste & Recycling helps fulfill this mission by meeting the County’s solid waste disposal needs by providing waste management services, protecting the environment, and promoting recycling in order to ensure a safe and healthy community for current and future generations. OC Waste & Recycling manages one of the nation’s premiere solid waste disposal systems, which serve 34 cities and over three million residents. OC Waste & Recycling operates a network of three active landfills and four household hazardous waste collection centers. Visit http://www.ocecochallenge.com/ for more information. For 25 years, Discovery Science Center (DSC) has been a non-profit organization dedicated to educating young minds, assisting educators to teach science and increase public understanding of science, technology, engineering and math through interactive exhibits and programs. With one of the largest education outreach programs in the county and an unparalleled approach at creating immersive, game-based exhibits, DSC is revolutionizing how educational content is delivered. Throughout the year, guests can take the Eco Challenge and become a green superhero or feel the power of a simulated rocket engine launch. Traveling exhibits and annual events such as Spooky Science and Bubblefest throughout the year ensure that there is always something new to discover. In 2012, DSC was named one of the ten “Most Trusted Brands” in Orange County and in 2013 was awarded the National Medal of Service from the Institute of Museum and Library Services. DSC owns and operates the Taco Bell Discovery Science Center based in Santa Ana, California and will be opening a second facility in Los Angeles in 2014. For more information, call (714) 542-CUBE or visit http://www.discoverycube.org/.